The chairman of Bosnia’s Presidency Milorad Dodik opened on Tuesday the 22nd International Fair of Economy in Mostar, one of the most significant and most visited economic events in the region that also offers politicians to meet and discuss outstanding issues. “When this event began 22 years ago, it was unthinkable that the fair could become this strong and noticeable,” Dodik said as he opened the fair. Participants from 30 countries will throughout the next few days present their products at the fair. Numerous officials and representatives of the economy, sports, culture and religious leaders attended the ceremony, Serbia’s President Aleksandar Vucic among others. Dodik emphasized the participation of China, noting that the global economy is stagnating while China’s is growing. China is this year’s partner of the fair, which will last until April 13. “The fact that the People’s Republic of China is a partner speaks of the strength of the fair which is noticeable not only in the region but on a global scale,” Dodik said. He extended special thanks to Serbian President Aleksandar Vucic whose government was the partner of last year’s fair. 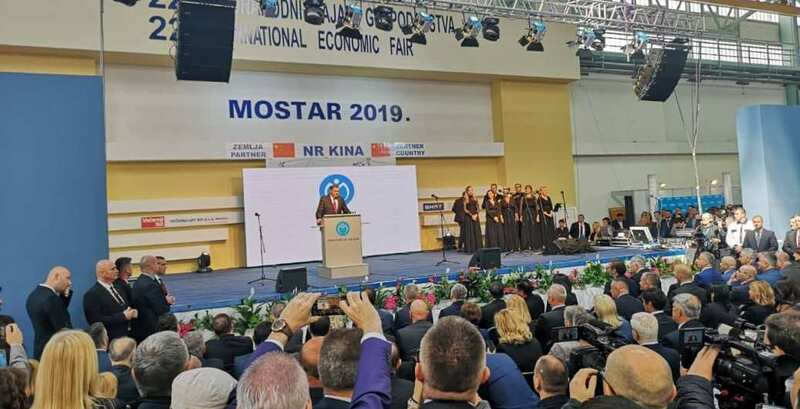 “The fair is not only an economic meeting but also a meeting of cultures, and that can be seen here in Mostar,” he said. Previous articlePupovac: First Serb might become member of European parliament soon?